Opportunity: Yeppoon primary school teacher, Robert McElhone played at the 2017 AFL International Cup for his native Ireland at the iconic MCG. 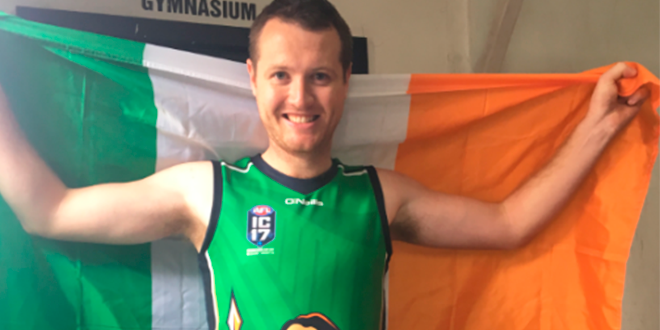 PLAYING football at the 2017 AFL International Cup for his native Ireland at the MCG and finishing third in the world was an unforgettable experience for Yeppoon primary school teacher, Robert McElhone. Mr McElhone and his Irish team joined 20 other nations for the two-week amateur carnival in Melbourne from August 5-19. A teacher at Sacred Heart Catholic Primary School and member of the Yeppoon Swans AFL Club, Mr McElhone said playing in the event was an amazing experience. “Representing my home country on the international stage was a huge honour, not only for myself, but for my school and my club,” Mr McElhone said. Ireland were beaten on the siren by New Zealand missing a berth in the grand final against Papua New Guinea, then going on to defeat the United States to finish third overall. “We had beaten PNG in our first game, but they managed to find their way into the final on percentages with a dream run in their remaining three games. PNG beat New Zealand by a point to win the series in a very tight competition,” he said. When asked how he would describe his experience, Mr McElhone said, “Amazing. Representing my country in the international stage was a huge honour. Not only for myself, but my school (Sacred Heart Yeppoon) and my AFL club Yeppoon Swans who I received huge support from. Scoring a goal against PNG and beating traditional archrivals, Great Britain, were also personal highlights he said. The AFL International Cup is played every three years and teams are comprised solely of amateurs who must be nationals of the country – other than Australia – that they represent.